For those looking to stay fit year-round, your local sports center is an excellent option. Not only is it a place to participate in fitness courses or join an adult league, but it’s also a community gathering space. Sports centers are slowly becoming the new favorite place for Americans to be, especially those in Indiana where the summers are short and the winters are cold. Here are the 10 best sports centers in the state! The Kokomo Family YMCA has been providing the residents of Kokomo a place to go for exercise, childcare, and swim lessons since 1910. Since then, the Kokomo YMCA has relocated itself three times throughout the downtown area. Last year, the city decided to build a newer, more eco-friendly building on Main Street. 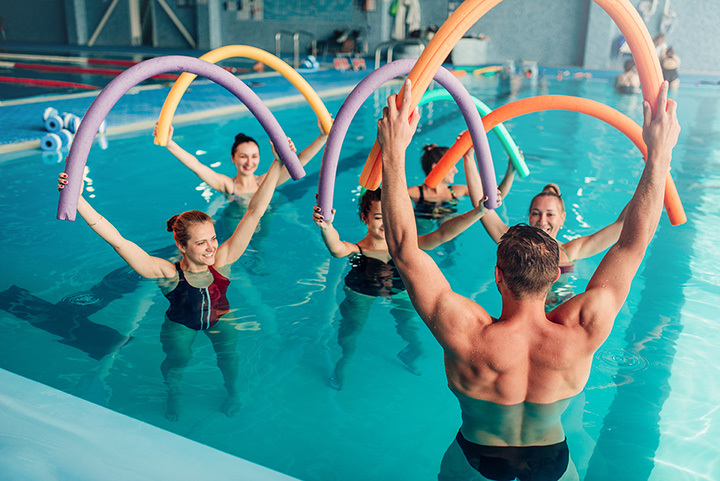 Here, residents can participate in a number of fitness programs such as swimming laps in the new pool, taking exercise classes from Zumba to PiYo, Rock Steady Boxing, etc., as well as participating in personal, one on one fitness training. The YMCA has a variety of activities for all ages to stay fit and healthy. The Metro Sports Center in Evansville, Indiana, is the tri-states only indoor climate controlled sports facility, and is 35,000 square-feet. Here, you can play sports such as soccer, volleyball and football any time of the year, rain or shine. You can also enroll in the center’s Porter Pitching Academy and learn how to pitch from the best of the best. For the kids, Metro Sports Center also offers day camps for children ages 5-12. You can also rent the facility for trips, meetings, parties, etc. The Hamilton County Sports Complex is THE destination for families and quality sports instruction. The facility is 64,000 square-feet, and comes with a fun learning environment, a family friendly atmosphere, and so many activities to choose from! The goal of HCSC is to encourage the Noblesville community to exercise, socialize, and develop their athletic skills in a safe and friendly environment. One of the activities offered as HCSC is Rhythmic Gymnastics, a unique blend of dance, art, and sport that combines elements of modern dance, acrobatics, and ballet. There is also a party and play zone for the kids which offers miniature zip-lining, bounce houses, and so much more! The NIFS is located in downtown Indianapolis on the IUPUI campus. The NIFS is a non-profit organization, established in 1985 by members of the Indianapolis community. What makes NIFS different from other sports centers is that they have over 40 on-site fitness centers and even provide electronic based fitness services for companies throughout the U.S. The NIFS also offers nutrition and wellness programs in which members (and non-members) and their families can meet with a registered dietician to help gain and build healthy eating habits, including healthy grocery shopping habits and meal planning. At Athena Sports and Fitness in Crawfordsville, Indiana, it’s all about your life, your health, your choice. The fitness center is over 23,000 square feet of fun, friendly fitness. There are three areas of fitness to choose from: cardiovascular, weights, and the free weight area. If you aren’t comfortable working out in front of others, you can also schedule a complimentary training session at NO COST. You can also choose from over 50 exercise classes, including water aerobics in a heated indoor pool! The Franciscan Health Fitness Centers offers two locations in Indiana: Chesterton and Schererville. In the Schererville location, the facility offers over 80 fitness classes a week plus an indoor track and the largest indoor cycling gym in northwestern Indiana. There is also a salon and day spa, a café, and a wellness nurse available for any fitness questions you may have. In the Chesterton facility, you can find cardio equipment with flat screen monitors, and over 60 fitness classes. Both locations also offer free, supervised KidZones. Located inside the Faith East Community Center in West Lafayette is the Faith West Fitness Center. The facility is small compared to others at just over 3,500 square-feet but that doesn’t mean it lacks in its amenities for getting fit. There is a full basketball court, fitness area, two gyms, and a pool. They also offer fitness classes, personal training, taekwondo classes, swimming lessons, and so much more! Like to skate? Check out their skate park! One area of Faith West that stands out compared to other fitness centers is their PETE’s PALs program. This program is an aquatic and motor program designed to help children who have disabilities. Faith West Fitness Center also offers free childcare while parents are using the facility. JCC Indy has been a neighborhood and community resource in Indianapolis since 1941. The facility has strived to create a multi-generational, all-inclusive environment where people of all ages can live, learn, play and connect with one another. They believe in optimal healthy living for the mind, body, and spirit. In addition to offering a wide variety of fitness classes for youth and adults, they also offer a small selection of dance classes (ballet, classical, tap, etc.). You can also take martial art classes, tennis classes, and other sports classes as well. The Yorktown YMCA has been the place for Muncie residents to go since 1913. Much like any other YMCA, the Yorktown YMCA offers youth and adult classes, as well as classes for seniors. Youth can enjoy basketball, cheerleading, martial arts, wellness classes, and swim lessons. Adults can enjoy swimming during open pool hours, boot camps, boxing, tennis, water classes, and more. Seniors can also enjoy light fitness classes such as Aqua Zumba and Hydro Fit. Like the Kokomo YMCA, the Yorktown YMCA also offers childcare for those using the facility. The Richard A. Carlucci Recreation and Aquatic Center is the place to go for aerobics and other fitness aspects in Plainfield, Indiana. With over 80 fitness classes a week, members can choose to do cross training, cycling, kickboxing, Pilates, yoga, and Zumba. There is also a huge fitness center featuring over 60 cardio machines, where residents can exercise on elliptical, bicycles, steppers, and more! The facility also offers PlayWorld, a supervised area for children while their parents work out. The biggest attraction at Richard A. Carlucci is the indoor splash island water park! It’s fun for the whole family this year! View more Indiana Sports Centers and Complexes.